In 1994, Pivdenne Design Bureau launched a short (up to 100 km) and medium-range (up to 500 km) missile system design, Borysfen. The Grim missile system design, which has already been demonstrated to foreign customers, is believed to be more perfect. 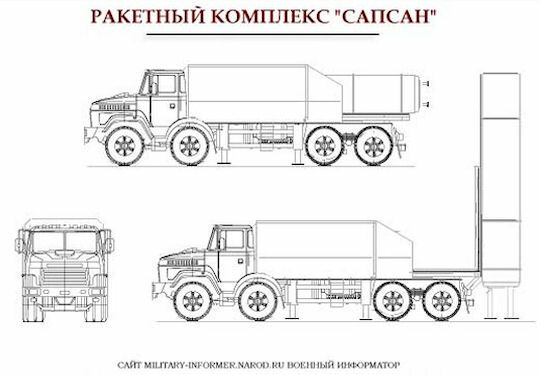 It is intended to defeat single and group stationary targets at the range of 80-290 km, thus, playing the role of Ukraine’s “non-nuclear deterrent forces”. The pre-production missiles would reportedly become available in 2011; additional funds were necessary for serial production of the missile intended for induction into Ukraine’s Armed Forces by 2015. So, the work has been suspended. Actually, Borysfen and Grim are prototypes of the modern Sapsan missile complex built o­n these projects. Ukraine was going to build its own state-of-the-art missile complex called Sapsan. This has been stated by President of Ukraine V. Yanukovych in early April during his visit to Kharkiv military factories. The new missile system will be developed by Pivdenne Design Bureau, which has designed 12 out of 20 missile projects, and will be built with the help of all Ukrainian missile defense plants, as reported by Deputy Director of the Department of Press and Public Relations of the Defense Ministry K. Sadilov. He said this will be a National Design Project. Compare MPMS Sapsan with Russian analogue (MPMS Iscander), the Ukrainian system is more compact (21 tons vs. 42 tons), mobile, and slightly more accurate (circular error probability up to 20 meters vs. 30 meters). According to developers, cost of the system will be much less than of Russian complex Iscander, whose estimated cost is 300 million USD. Designers noted that cost of developing the MPMS Sapsan would be much less than of MPMS "Iscander" – 450 million USD vs. 1 billion USD. as of February 2014 the estimated term of introduction in Armed Forces of Ukraine was 2017. The expected order is 200 units of MPMS Sapsan. A decision to create the Sapsan multifunctional operational-tactical missile complex (OTMC) has been made by the National Security and Defense Council of Ukraine as early as 2006. The system will combine both tactical and theater-of-war missiles. In 2009, USD 6.8 million was allocated for OTMC design works, of which the lion’s share was given to Pivdenne Design Bureau that successfully defended the Project. The National Space Agency of Ukraine (NSAU), which coordinates the Project, got the rest. The new weapon was expected to be tested in 2012-2013. Although originally scheduled for deployment in 2015, the Project has been delayed due to technical difficulties and a lack of funds. The estimated construction cost of the new missile system is UAH 3.5 billion or USD 440 million. In April 2011, Ukrainian President Viktor Yanukovych said that the Yuzhnoye Design Office had resumed the development of the Sapsan missile complex and had already defended the sketches of the project. About UAH 3.5 billion was needed to create a new missile system in Ukraine. 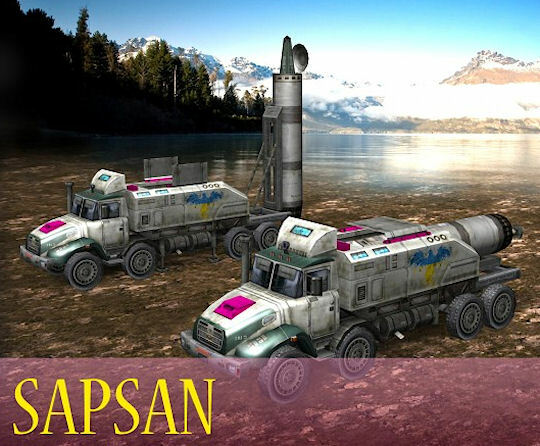 The tests of the Ukrainian Sapsan multifunctional missile complex will begin in 2015, Head of the State Space Agency of Ukraine Yuriy Alekseyev has said 31 December 2011. "Ukrainian cooperation as part of this project is quite broad. These are the enterprises of Ukroboronprom and the State Space Agency. Today we are able to create Sapsan [missiles] despite statements in the press. If financing is provided today, then I think flight tests could start in 2015," he said. The Ministry of Defence suspended funding of the project of development of the Sapsan Tactical Missile System in June 2013 despite having all the approved programs and legal permits to create a rocket. The Ministry of Defense will abandon a programme for the development of the tactical multi-functional missile system Sapsan, Defense Minister Pavlo Lebedev told reporters in Kyiv on 26 June 2013. "We have refused the programme to develop the Sapsan missile system. For several years, the company, who led the work, has spent more than UAH 200 million without producing a prototype and making the design documentation," the minister noted. At the same time, he added that another company "offered an alternative missile and in a few years may also develop a prototype." Lebedev also added that the alternative development belonged to the State Kyiv Design Bureau "Luch" (SKDB Luch). Chief Designer of Pivdenne Bureau Oleksandr Deht’ar’ov stated that the rocket was being designed in the interests of an unnamed foreign customer. In order to save the project on the creation of the Sapsan tactical missile system, which is one of three main priorities of the modernization of the Ukrainian army along with the An-70 aircraft and the corvette, Pivdenne Design Bureau started creating the export version of the missile systems financed by foreign customers. Head of the State Space Agency of Ukraine Yuriy Alekseyev assured journalists at the Paris Air Show 2013 that there is technical and technological capacity to create such a missile. The project comprising 99% of Ukrainian components and involving 47 companies may be the basis for the formation of the national non-nuclear means of deterrence, Alekseyev said. He assured that though they hadn't yet conducted the testing of fuel for the tactical missiles, technologically the task has been solved. Chief Designer and CEO of Pivdenne Design Bureau Oleksandr Dehtiariov said that the missile complex is currently being created in the interests of a foreign customer under the name of Thunder. And thanks to the completion of the development of the Thunder project, the Sapsan missile project will make progress as well. The missile system designed for foreign countries will have a range of up to 280 km. The Ukrainian modification of the missile will have a range of up to 500 km. "I suppose, Thunder will appear before Sapsan, Dehtiariov said, adding that the performances of both missiles should not be worse than those of Russia's Iskander. The problem was that in fact, supply of such systems for export is very questionable itself because it falls under the regime of export control and distribution of critical technology – the missile technology. Therefore, this market is very questionable and very risky, one can run into sanctions here – this is one thing. Another thing is that in these circumstances, the funding of this project lay entirely on the domestic manufacturer i.e. the Ministry of Defence, and the Ministry of Defense simply did not have these funds. Since they stopped the funding, it meant this system isn't a priority for them. However, in fact, both in the Ministry of Defence and the General Staff, serious doubts were expressed on the practical suitability of this system that should fit both within the military doctrine and the strategy for national security. Therefore, the only reason this system had been funded before was Pivdenne Design Bureau lobbying this project. The thought this system was absolutely unnecessary. Ukraine didn't have an enemy it could stop with this missile system if it was designed as a deterrent weapon. It depended what kind of threat scenarios the General Staff and higher political leadership are considering. If such threats are, for example, the possibility of an attack from Russia, then there was no point at all to design a system with 40 to 60% of the components being supplied from Russia. If this system was considered for deterring Romania, for example, Romania wouldn't start any aggressive military campaign against Ukraine – it was enough to carry out massive pasportisation in the border regions. To deter such actions with a missile system is absurd. The issue of the creation by Ukraine of the Sapsan new multi-purpose missile system remained open, and the space and rocket industry is continuing to work on the program, Head of the State Space Agency of Ukraine Yuriy Alekseyev said 27 December 2013. He said at a press conference in Kyiv that the decision to close the state target defense program for the creation of the new multi-purpose missile system should be made by the president and the National Security and Defense Council (NSDC) of Ukraine. "The question of Sapsan is not closed. There should be the decision of the president and the NSDC. I don't accept any statements by the military," Alekseyev said. "I appealed to the supreme commander-in-chief [the Ukrainian president]. The work [on the program] is still continuing. The subject is not closed," he said. The state targeted defense program on the creation of the Sapsan multi-purpose missile system was approved by the government in November 2011. Its financing until 2020 amounts to UAH 6.6 billion.